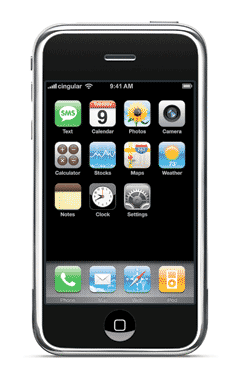 CUPERTINO, California—February 5, 2008—Apple® today added new models of the iPhone™ and iPod® touch which have double the memory, doubling the amount of music, photos and videos that customers can carry with them wherever they go. The revolutionary iPhone now comes in a new 16GB model for $499, joining the 8GB model for $399. iPod touch now comes in a 32GB model for $499, joining the 16GB model for $399 and the 8GB model for $299. Both iPhone and iPod touch feature Apple’s revolutionary Multi-Touch™ user interface and pioneering software that allows users to find and enjoy all their music, videos, photos and more with just a touch of their finger. All iPhone and iPod touch models include the latest software enhancements announced last month including the ability to automatically find your location using the new Maps application*; create Web Clips for your favorite websites; customize your home screen and watch movies from the new iTunes® Movie Rentals. Both iPhone and iPod touch feature the world’s most advanced mobile web browser in the world with Safari™ and great mobile applications including Mail, Maps, Stocks, Weather and Notes. The new 16GB iPhone is available immediately for a suggested retail price of $499 (US) through the Apple Store® (www.apple.com), Apple’s retail stores and AT&T retail and online stores. The 32GB iPod touch is available worldwide immediately for a suggested retail price of $499 (US) through the Apple Store (www.apple.com), Apple’s retail stores and Apple Authorized Resellers. iTunes Movie Rentals are available in the US only. iPhone and iPod touch require a Mac® with a USB 2.0 port, Mac OS® X 10.4.10 or later and iTunes 7.6; or a Windows PC with a USB 2.0 port and Windows Vista or Windows XP Home or Professional (Service Pack 2) or later and iTunes 7.6.